When it comes to medical waste, each subcategory has its own regulations for being properly disposed of. Bio-hazardous medical waste containers requires special attention to ensure it is properly disposed in compliance with state and federal regulations. Four types of bio-hazardous wastes exist, each of which need to be treated uniquely when disposing. Solid biohazardous waste consists of non-sharp items that came in contact with human or animal specimen materials—such as tissues or bodily fluids. This might include petri dishes, personal protective equipment, and towels. Container: This type of waste should be collected in a designated container with a lid that is lined with an autoclave bag and marked with the biohazard symbol. Liquid biohazardous waste consists mainly of bloody and bodily fluids that could be contaminated with infectious agents. Container: All liquid biohazardous waste must be collected in leak-proof containers secured against tipping over and labeled as biohazard. Additionally, the primary liquid containers can be placed in a secondary vessel—such as a tray or bucket. Sharp biohazardous waste (also referred to as sharps) consists of any medical device that came in contact with potentially infectious biological material that is sharp enough to puncture the skin. 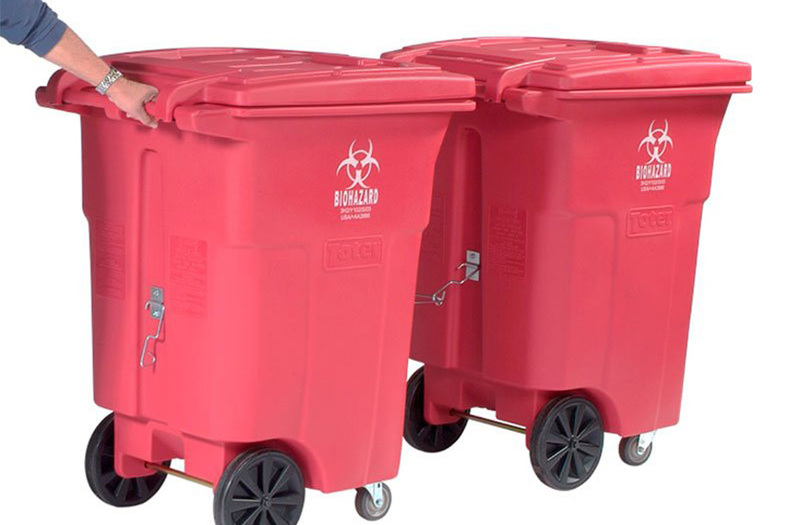 Container: Sharps containers are designed to be puncture-resistant, leak-proof, and safe to handle. Regardless of biohazard status, all sharps are collected in such containers, but biohazardous sharps should be labeled with a corresponding symbol. Pathological waste includes removed human (or animal) organs, tissues, and body parts that have been exposed to infectious agents. Container: To prevent potential leaks, pathological waste should be double-bagged and stored similarly to liquid waste in secondary containers.